Get ready for taco night! 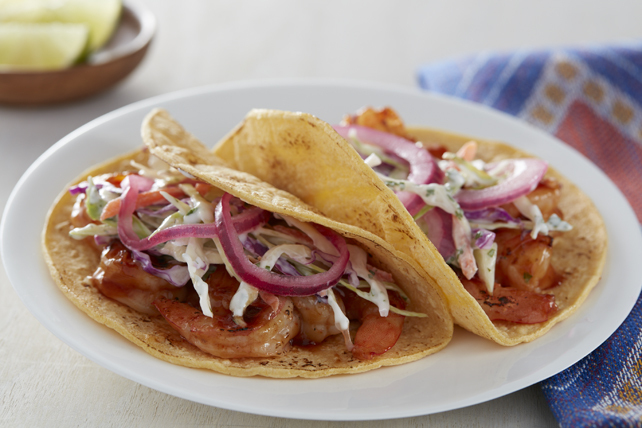 These Chipotle BBQ Shrimp Tacos with Pickled Onions are perfect for everyday entertaining. Rinse onions under warm water; drain. Place in small bowl. Add half the lime juice; mix lightly. Mix cilantro, Miracle Whip and remaining lime juice until blended. Add to coleslaw blend in large bowl; mix lightly. Combine barbecue sauce and peppers. Thread shrimp onto skewers. Grill 4 to 6 min. or until shrimp turn pink, turning and brushing frequently with barbecue sauce mixture. Remove shrimp from barbecue; set aside. Add tortillas to barbecue; cook 30 sec. on each side or just until warmed. Remove shrimp from skewers; place on tortillas. Top with coleslaw and onion mixture; fold in half. For a milder flavour, omit the chipotle peppers.